Last month, I sewed up several sets of cloth napkins for my oldest daughter's "Green Team" Earth Day Fair. 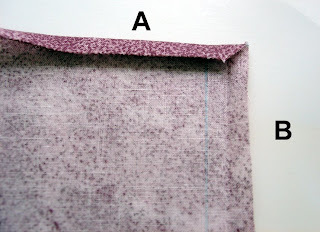 The napkins were a fast and easy way to reduce my fabric stash, so I thought I'd share this tutorial with other fabric addicts to help reduce both their stash and their trash! 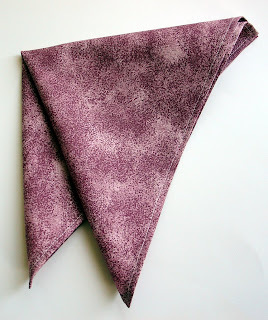 These napkins are cute and casual with tidy mitered corners. 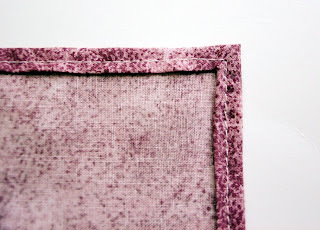 There are lots of other good napkin tutorial out there. 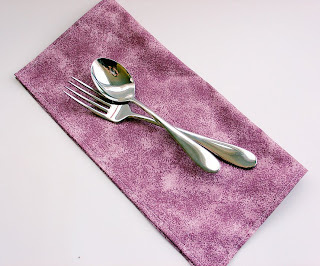 I adapted techniques from this tutorial to make my napkins. The napkin pictured above is a 12 inch square. This technique uses a 1/2 inch hem allowance so my finished napkin is an 11 inch square. Feel free to change your dimensions as dictated by your napkin needs. I recommend using a rotary cutter, but scissors will due in a pinch. 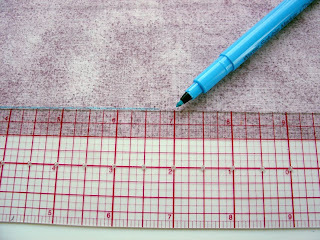 Using the water soluble fabric pen and the clear ruler, mark a line 1/2 inch in from the edge. Repeat on all sides of the napkin. To reduce bulk when you miter the corners, clip the corners using the marks you just made as the start and ending points of your cut. 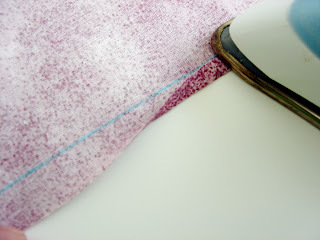 Carefully fold the edge of the fabric up to the marked line and press with a hot iron. Repeat on all sides. Now it's time for the fun part: mitering the corners. At one corner, open up the fold on Side B. 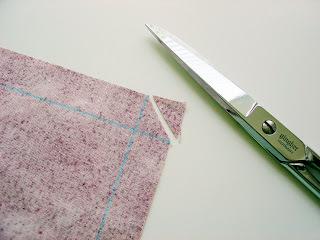 Carefully fold Side A along the marked line, enclosing the raw edge. Fold the corner down, lining up the folded edge from Side A with the marked line on Side B. I found my awl very helpful for the following maneuvers because I've got chunky fingers. 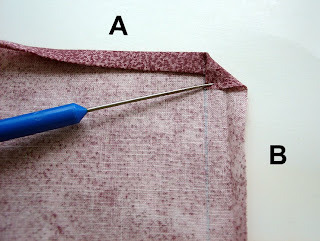 If you don't have an awl, a seam ripper works well, too. Refold Side B to the marked line, making sure to keep your corner folds tidy. Again, I would have been lost without my awl to help with this. Finally, fold Side B along the marked line, enclosing the raw edge. Isn't that a pretty miter? Pin the miter in place. 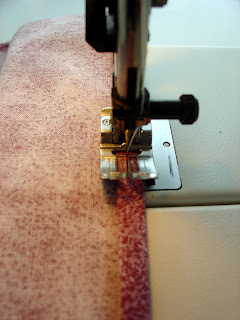 Continue around the napkin, mitering the corners and folding along the marked line to finish the hem. I like to press the hem again after the final fold, although if I'm in a slap-dash mood, I'll just pin the final hem in place. 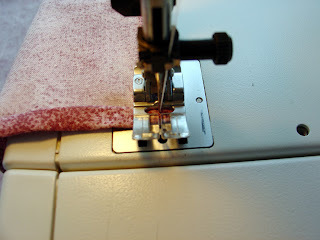 You can also try pressing both hem folds before mitering the corners. It didn't work out so well for me because the extra folds interfered with my miters but you may have much more nimble fingers than I do and end up with great results. 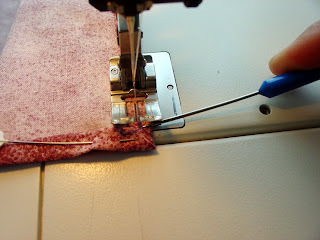 Starting in the middle of a side, begin top-stitching the hem. 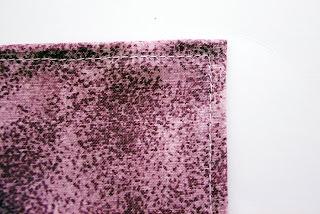 I stitch about 1/8 inch from the fold. Keeping the miter in place while sewing it is a bit fiddly. Hopefully you can see how I use my awl to keep the miter in place while it moves closer to the sewing machine needle. 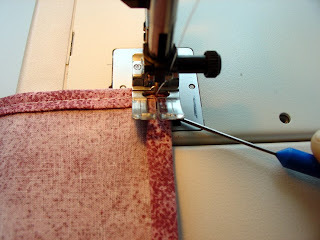 Sew until your needle makes its first entry into the miter. 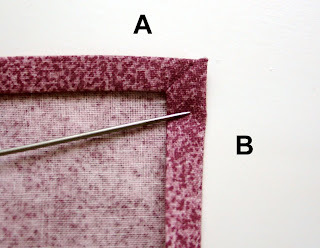 Leave the needle in the fabric and pivot the napkin. Here's what the miter looks like from the back. And here it is from the front. 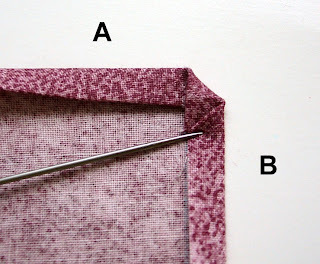 Continue sewing around the napkin until you reach the beginning of your stitching, make a few back stitches, clip your threads and you're done! Let me know if this tutorial worked for you or if you have any questions. And Happy Belated Earth Day! I've just read about 10 tutorials on the web and yours was by far the simplest and yet the most detailed. A picture at every step of the way is worth a thousand words. Thanks so much for posting this. I loved your tutorial. 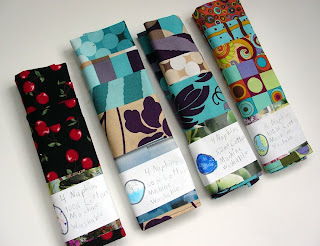 I had to hem some fat quarters for tablecloths and found your directions to be just perfect to get the job done. Thanks for taking the time to share your tips. Fantastic tutorial. I agree; I've sat here reading examples that made my head spin, and yours was so simple. Thank you. 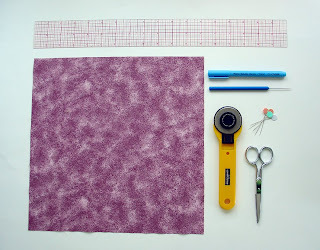 This is a great tutorial, especially with the tip about the awl! I'm using fat quarters to make napkins and this was super helpful. Thanks! 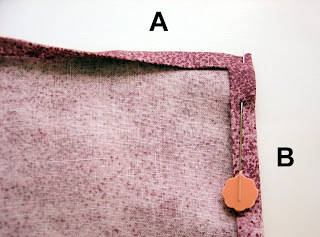 This is a great tutorial, especially with the tip about the awl. 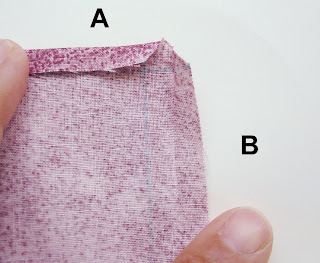 I am making napkins from fat quarters and this was super helpful. Thanks! Thanks so much for this wonderful tutorial. I need to hem 8 Christmas napkins, started the job and ran into bulky corners. I appreciate your sharing this technique. Thanks so much for this wonderful tutorial. I started he hemming 8 Christmas napkins and ran into bulky corners. Thank you for sharing this technique. Super clear and a beautiful finish! Thank you for posting this.